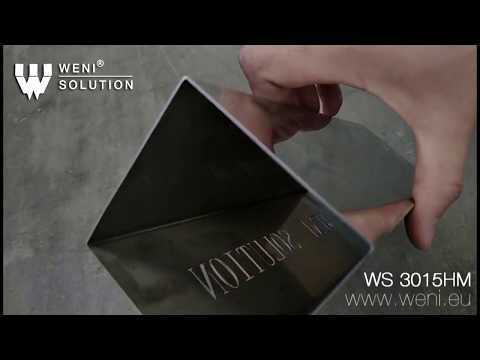 Weni Solution SERIA 3015HM – New professional model of ” High Power” laser cutter with an additional load platform, spindle for pipes and profiles with a length of 3m or 6m and full enclosure. In practice, it means two interchangeable working tables operating alternately, thus using the full production speed of the device. The ideal solution for full-dimensional production where the time of the material processing is most important. The case of the HM has a 4-chamber extractor system, fully sliding side and front doors, an even additional camera installed with an LCD monitor, which allows You to monitor working process of the machine. Laser includes two open tables with working area of 3000x1500mm and laser power up to 12000W. The machines are characterized by high speed and the best parameters. The control system is located in a separate, freestanding cabinet, so it is not exposed to damage and disturbances related to the operation of the device and also makes operations much easier for customer . All axes are driven by the latest Schneider servo motors, which are characterized by high accuracy and very high durability. The device includes an efficient laser, auto focus, stable CypCut software with NESTING function (automatic optimization of project placement on the material), dual cooling system, voltage stabilizer, lubrication system and dust extraction system. The use of heavy construction, made of high-quality metals alloys and submiting device in the process of long-term and special treatment removes resulting strains in the material, which significantly reduces vibrations, shocks and shakes, making the FM series characterized by high stiffness, stability and shock resistance,and the processed materials retain the given parameters.